… if you didn’t read it then, now would be a good time to ask yourself if you really care that weekly contributions of $34 could potentially grow to over $76,000 in 20 years, as proudly proclaimed by Fidelity? 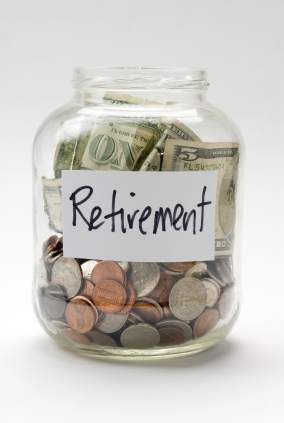 Let’s not dismiss too quickly the good old save-your-way-to-retirement advice. Saving $15k/year for 40 years yields an expected $2.5M in today’s dollars (for what it’s worth: $10+M in retirement dollars), assuming your investments go up 5-6% per year after inflation. Let’s not dismiss it too quickly, indeed. Retiring with $10 million in your pocket (albeit, ‘only’ worth $2.5 million in today’s purchasing power) is none too shabby. 3. You have to average 8% to 10% return on your type of investment – but it has to be one that lets you add $15k annual increments for 40 years (which ties you to ‘standard’ products like, CD’s, bonds, stocks, and mutual funds). 4. You MUST be disciplined enough to stick to this simple strategy for the entire 40 years WITHOUT WAVERING in up/down markets: the Dalbar Study [ http://www.canadiancapitalist.com/investors-behaving-badly/ ] says a firm NO to being able to achieve anything like this rate of return. This entry was posted in Saving and tagged 7million, 7million7years, Investing, money, retirement, Saving, Starting Out, wealth by Adrian. Bookmark the permalink. Thanks for the mention! I agree that saving your way to retirement isn’t as easy as it looks on paper. First, you have to save. Then, you have to invest wisely. As the old saw goes, it’s simple but ain’t easy. Well, it’s not exactly a “myth”; someone who does this strategy will be far better off than someone who doesn’t. I know many people in their 40’s and 50s who have nothing, and I know more that look wealthy but are really “house poor”. If they followed the above strategy they would be far better off. However, for someone who wants to feel wealthy and not simply “ok”, then I agree that more has to be done. I still am unconvinced about 15-30% returns with real estate, but I am biased because our current market is at a peak (I am Canadian). I do have to admit you can get some pretty nice leverage out of RE that is simply much riskier/more difficult to do with most other types of investments. Owning your own business is another great way to do it, so long as you make it work! I’ve worked hard to be completely consumer debt free and have paid off my company tax so now my only bills are living expenses and my mortgage payment. The mortgage is for £260k on a property valued at £500k and I’m paying on an interest only basis. My concern is that I have no strategy for paying off the mortgage on maturity besides selling and taking any equity (£240k). My wife and I will want to move to a smaller place on retirement so we have no emotional issues with selling. I can’t help wondering whether it’s better to look into paying off the mortgage, either via some financial product, switch to a repayment mortgage or overpay on the interest only mortgage? I’ve built up a number of passive income streams over the years (mostly websites) which bring in an extra £1k a month and I’m working on some bigger web-based ideas as well. Keep up the good work as I love the site. For the average person, saving is the only way to retire and be comfortable. I will agree it won’t make you 7 million in 7 years, but it will allow you to retire comfortably. The average person won’t run a successful business, or invest in real estate. The easiest options for the average person is by way of their 401k and IRA accounts. If you save enough early on, then retiring before your 60 is still a very real option. Saving is the most important thing anyone can do. I know some folks who make lots more than I do, but only have half as much because they like to spend. They weren’t taught to save. Their are quite a few broke Doctors and Lawyers out there who make mid six figure salaries. A little saving for them could go a long way. I know for me personally, my wife and I’s savings are on track to allow us to retire at 53/51 respectively. Perhaps if we bump up our savings a little more we could do it in our late 40’s, but we are trying to balance doing things now, instead of putting away everything for the future. This is one subject that I will have to disagree with you on. Not from the standpoint of making 7 million in 7 years, but from the standpoint that, if you don’t save it doesn’t matter how much money you make, you will always be relying on making it, because you didn’t save any. What Lee said – savings won’t make 7 million in 7 years (unless you’re an A List celebrity or similar) but for most people it’s better than the alternative. Here’s another way of looking at it – your “number” will be at least partly dependent on your living expenses (i.e. how much you spend). The lower your expenses the lower your number and (by implication) the less time it will take to make it. If you are saving some of your income you are not spending it and therefore should have a lower and more readily attainable number. If nothing else, even for entrepreneurial types, savings often form the seed money for other ventures. @ Winalot – I paid down my mortgage over time; I think interest-only on your own home mortgage is dangerous for exactly the reasons that you mention. My two rules are: do not put TOO MUCH of your net-worth into your own home (no more than 20% … especially when you are still trying to work towards reaching your Number), and don’t take on more mortgage than you can afford (25% of you net income is a nice maximum). These are nice thoughts, however, the reason for this training is to allow you to make(earn,or whatever) the money needed to live the lifestyle you wish , not some dubbed down version of it. You don’t wish to spend your entire life on a limited income(which is what your advocating by trying to save your way to riches). The average person cannot max out there retirement and save for rainy days AND save for college impossible! I am determine to retire from the 9-5 by 45, from there it’s all about growing businesses. After 50, more and more companies start to discriminate you. @ MoneyMonk – Isn’t it the 50+ retirement age in Greece (that they now want to lift to 60+) that’s causing all of the riots over there? Actually I am not advocating living a “dubbed down” version of the life I want – I have no wish to live like an unreformed Ebenezer Scrooge and I am pretty sure that mrs traineeinvestor would have something to say if I tried. But I do believe that there is a trade off between the level of spending and the number needed to support that level of spending with consequences for the length of time needed to achieve that number. If your life’s purpose requires higher spending, fine. If it doesn’t is it really worth spending money when doing so will delay your ability to achieve that purpose? It’s a matter of individual choice of course, but for me it’s not. I’d love to have a Ferrari but for me it’s not worth delaying my retirement.